Classic Caponata made with our fresh extra virgin olive oil! 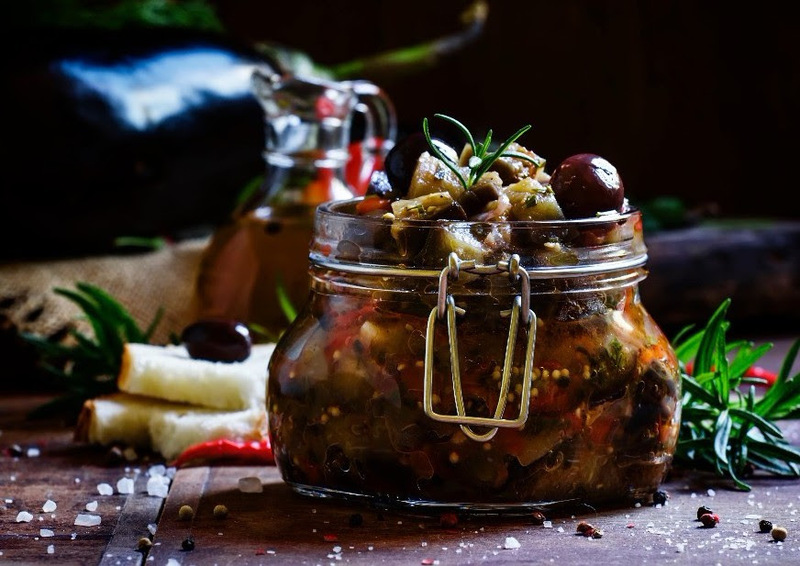 Caponata is a cornerstone of Sicilian cuisine. At its heart is the aubergine, the purple eggplant. Bright, crunchy, salty, served warm or cold, as an appetizer, pasta, flatbread or pizza topping we suggest you bookmark Caponata for any meal or weekend snack. Because we just received our fresh shipment of Sicilian olive oil, now's the perfect time to make this sunny Mediterranean recipe. TIP: For extra crunch add 1/2 toasted pine nuts before serving. After washing cut eggplant into ½ inch cubes (do not peel). [You do not need to salt eggplant prior to frying. Most eggplant available today is not bitter.] Heat 1/4 cup olive oil over medium heat in a medium sauce pan [about 1- 2 inches deep]. Add the eggplant and sauté until it starts to turn golden, turning as needed, about 5 minutes on total. Do in batches if you're using a smaller pan. Remove and place to the side on paper towel to absorb extra oil. Add onion and celery to saucepan. Add 1 tsp salt. Sauté until soft. Add additional oil if needed. Then add oregano, olives, capers and chopped tomatoes (if canned) and simmer for about 20-25 minutes. While simmering, whisk sugar with red wine vinegar then pour over the pan when simmering is complete. Heat 3-5 minutes. Add parsley and simmer for an additional 2 minutes. Remove from heat, add salt and pepper to taste. Serve on crusty bread toasts, gluten-free for your Vegan friends.